“You dream you are smoothed by an evening of rain.” Enter an elemental landscape that celebrates love, wildness, and all that wind and rain conjure. Poet Rosemary Starace and singer-songwriter JoAnne Spies trade art forms and collaborate with each other and the elements in this interactive theatrical performance. Guitar, dulcimer, drums, melodicas, accordions, rattles, and chimes will accompany original and familiar pieces spoken, chanted, and sung. 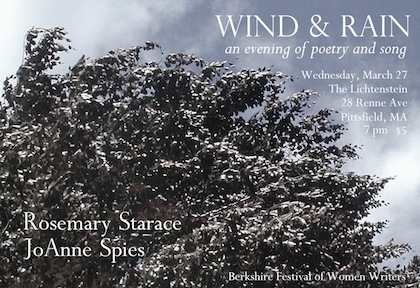 Part of The Berkshire Festival of Women Writers.